Eisenberg's long term series, 'A Sojourn in Seasons', consists of five chapters - one in black and white and four seasonal chapters in color. The large-scale, abstracted images of the treed landscape in this series are captured with an oversized pinhole or defocused lens. The images are usually segmented and presented as diptychs, triptychs or quads, printed on long panels of Japanese Kozo paper and infused with encaustic medium. The final presentation of translucent panels hang from acrylic bars with magnets, floating off the wall, casting shadows, and moving gently with air currents in a room. Eisenberg began this series as her father was losing both his vision and his memory. As the images fade in and out of recognizable form, they echo our ephemeral grasp on life. 'Sea/Shore' is a series based in areas where land and water meet. The multi-paneled pieces begin with a single or contemporaneously captured images shot with a very soft focus or slowed shutter speed. Printed on very thin Japanese Kozo and adhered to sanded acrylic panels with acrylic medium, the resulting translucent pieces in shades of blue, green, gray and white resemble the sea glass that one often finds at the waters' edge. The blur and segmentation of the imagery in the series require an active engagement from the viewer, who provides the missing elements of the traditional landscape from memory, and forms emotional wholes from the fragments. 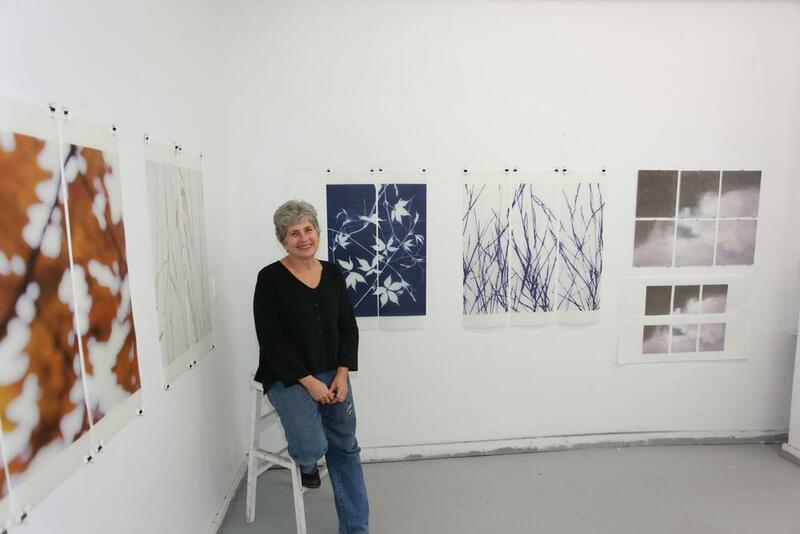 Eisenberg's newest series, 'Traces (After Anna)', is based on cyanotype photograms. The images are the shadows left behind by the weeds, seeds, grasses and vines gathered on walks in the vicinity of Eisenberg's rural upstate New York home. The cyanotype photograms are scanned, sometimes inverted, and printed on long panels of Japanese Kozo paper. They are infused with encaustic medium and often embellished with silver leaf, pigments, threads or beads. For Eisenberg, the pieces echo the physical world's eternal cycles and memories of loved ones passed - memories that are often vague or fractured, with only small glints of bright light to try to hold on to. The skies present an endless and ever-new canvas on which to project ourselves and our emotions. I am interested in the expressive nature of photography: my job, as I see it, is to present a piece of the world, and by conveying how I see it, to tell you something more, something about my internal state of being. But always the drive is to say, ‘stop for a moment, consider this, feel its wonder, its awe’. With full acknowledgment to Stieglitz and his Equivalents (Songs of the Sky was his original title for that historic work), this series furthers my own inquiry into the possibility of abstracted images being able to convey inarticulable emotions, and attempts to capture the ephemeral nature of beauty. I grew up near the ocean. Not on the ocean, or by the ocean, but close enough so that many long, languid summer days of my childhood were spent there with family, jumping waves and playing in the sand. Adolescence may have changed my companions on the beach blankets, but the ocean remained the backdrop of many halcyon days of warm water and warmer sand. And to appreciate the importance of its care and protection. These images are first printed with water-soluble, dye-based inks. This lets me brush or spray the printed images with water to make the dyes run in selected areas. It gives the imagery a very unusual quality as the dyes puddle and pool, and hues that lie just below the surface are brought forward to alter the photographic nature of the initial imagery. Those altered prints are then scanned, printed on long panels of Japanese Kozo paper with archival pigment inks (which are not water soluble), and then infused with molten encaustic medium. This makes the final pieces translucent in highlight areas and allows the work to hang without glazing.